One of the key components to filling the races on Hawthorne’s cards came from the Mississippi horsemen who spent the summer some 750 miles away from their home. Mississippians Curtis Rice started 80 horses at the summer meet. Freddie Patton Jr. raced 70 horses. Roshun Trigg sent out 50, Martin Woodward raced 40. Jamaica Patton had 30 go postward and Cornelius Cavett sent out 19. In the past many Mississippi horsemen came up Illinois to race their two-year-olds with the intention of having enough success on the fair circuit with them to get what they hoped were substantial offers for their youngsters. However with less state-bred stake races available and the purses for those that remain at lower levels than in the past, the interest in ICF freshman horses has diminished. Instead, horsemen like Trigg and Patton are keeping and racing their youngsters and it has paid off for both trainers. 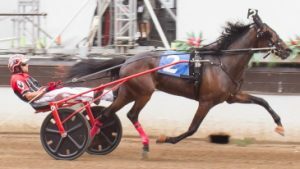 Roshun was the leading trainer on the Illinois County Fair Circuit and his young trotter Louscipher captured the Kadabra 2-year-old colt trot final on Champions Night as Trigg’s horses earned over $320,000 in 2016, far and away his best year. Freddie drove and trained the talented 2-year-old ICF pacer Princess Sage, the Incredible Tillie and Violet champion and Patton also enjoyed his best year with over $40,000 more in purse earnings than any other racing season. “It used to be that we often had young horses that weren’t good enough to race in Chicago but that’s changed. Now they are,” said Freddie. “I’ll be back next year to race my good young horses. I believe in racing 2 and 3-year-olds. Not everybody brings back a two-year-old and they race as good at three but I do. Mind come back as good or better. I most definitely will be back at Hawthorne next year and so will my son (Cornelius Cavett). The “ship” hasn’t gone down in Illinois but its listing badly, that’s for sure. The Mississippi horsemen have played a big part keeping things from going under and thankfully all signs point to a return from them in 2017. At one time the Chicago circuit had the best racing program in the country available to its players. Unfortunately that too as nosedived over the last decade and what was put out by Hawthorne at its recent meet was particularly sub-par for content. The left side of the program still has the past performance lines courtesy of the USTA but with a poor quality computer generated morning line that doesn’t even offer the player anything that indicates if a horse is going up, down, or is at the same class in the race. The program line was especially poor when the two-year-olds began racing and when horses came in from other racetracks. 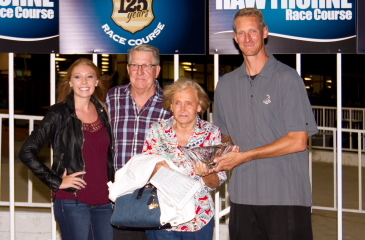 A good example came on Sunday’s closing night when OK Heavenly, who set a track record of 1:50.4 for an aged pacing mare in her last Hawthorne start prior to a third-place finish in a tough Hoosier Park $21,000 Invitational, was listed at 9-2 odds in a $10,000 Open. OK Heavenly won rather easily Sunday and paid only $3.80 as the 4-5 overwhelming public’s choice. Up until this year the right side of the program had a comment on every horse in the race. Now there is a comment on only three horses with a bigger type size to fill the designated hole.. The same Computer Analysis first used in the 1980’s in still there. Gone are any stories on tonight’s races, any features on horses, drivers or trainers, any human interest articles, or any pictures. However there was no shortage of Hawthorne Racetrack Promos on everything from its OTB parlors, its Buffets, its non-racing related advertising, and other items that didn’t help the bettor one bit. If this is what Hawthorne delivers on a front cover story maybe nothing written is a less an embarrassing choice. As far as the racing program’s $3.00 price, it’s way overpriced. The actual cost to the racetrack to print a program hasn’t gone up this century. Since it has no competition on sale at the track or the OTBs, and it has the only necessary information to handicap a race, the track can put any a price tag on it, just as long as the IRB approves and they always have. For years when the Chicago tracks wanted to boost income a bit they went to previous Illinois Racing Boards and requested another 50 cent hike “crying about the increasing cost of paper.” While the cost of paper was going up, the cost of printing the program wasn’t. The tracks just ordered paper by bulk and got cheaper and cheaper paper. At one time the color and the texture got so bad it looked and felt like the paper you dry your hands with in the Men’s Room. Come to think of it with recycling, maybe it was. Hawthorne’s first summer harness meeting in eight years is behind us and one of the major concerns going into it was would they be able to attract enough horses?. 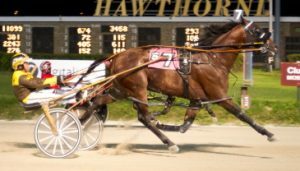 Before the summer meet got under way in early May the Illinois Racing Board approved Hawthorne’s request to scrap the five-night-week format that was granted to them seven months earlier at the Date Hearings for a Thursday through Friday arrangement. The IHHA approved the four-day format when the track agreed to race 45 contests a week. I wrote back at that time that I was optimistic that the horse population for 45 races on four racing cards a week would likely be doable. As the summer meet progressed my optimism dwindled. As I look ahead to 2017 I’m not optimistic at all, at least not at this time. Without a winter meet more small Illinois stables will go out of business before next summer comes along and some the bigger ones that venture to places like Ohio, Indiana, our further out East may never come back for what will be much smaller purses to race for at Hawthorne. My earlier optimism was based on a winter meet at Hawthorne that exceeded expectations in mutuel handle both off and on-track. The average handle in the winter meet was $916,596. The average handle for the summer dropped to $849,215, more than $67,000 a night below the winter figure and the January meet averaged $4,000 more a night on-track. The summer on-track attendance could have been higher, no-doubt boosting the on-track handle, if Hawthorne wasn’t charging its patrons $2.00 to get into its Grandstand that wasn’t air-conditioned. You read that right, no air-conditioning during one of the hottest and sticky summers in Chicagoland history. There wasn’t any air-conditioning in the Grandstand back in 2008, the last time Hawthorne had a summer harness meeting either. Eight years later and it still didn’t get fixed. The winter meet did have a stronger numbernt of open company horses, Most of those better open horses rarely ventured to Hawthorne for the summer meet and who can blame their owners and trainers when they were competing elsewhere for double the amount of purse money not only in Invites and Opens, but in mid and high level conditioned paces as well. That isn’t going to change until the playing field is leveled between Illinois and other Midwest states with on-track slot money. And is that more wishful thinking? Nelson Willis was Hawthorne’s leading trainer at its summer meet and his wife Cynthia Kay its leading owner. (Four Footed Photo). 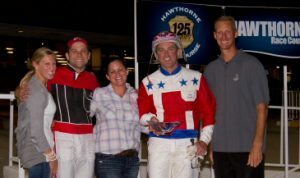 Congratulations go out to Casey Leonard who followed his leading driver honor at Hawthorne’s winter meet with another title during its summer session and to Nelson Willis, the leading trainer at Hawthorne’s summer meet. Casey, who tuned 39 on September 11, won at a 22 per cent clip while bringing home 185 first place finishers. Todd Warren was next with 147 winners, followed by Kyle Wilfong with 72, Kyle Husted with 70 and Dale Hiteman with 53. Willis sent out 54 winning horses in the summer session, 10 more than Frank Petrelli, who came in from California. Rounding out the Top Five in the trainer standings were Terry Leonard, Ronnie Roberts and Kim Roth. At today’s Illinois Racing Board meeting, the 2017 horse racing dates were announced. Summer is already behind us and sadly so will the 2016 Hawthorne harness racing meeting after tonight’s 14-race program. Both pasted much too quickly. Sunday’s last season card at Hawthorne is headed up by the $18,900 Violet Trot and the $31,050 Violet Pace. Both championships are for 2-year-old ICF fillies. Danny Graham’s unbeaten home-bred Anna’s Lucky Star (Kyle Wilfong), seeking her seventh in a row, will no doubt he the heavy public’s choice in the ninth race Violet Trot however the tenth race Violet Pace doesn’t have a clear-cut prerace favorite. Take your pick between Princess Sage (Freddie Patton Jr.), Razzleme Dazzleme (Kyle Husted), My Kind Of Dance (Casey Leonard) and Dee Tumbleweed (Cornelius Cavett) as far as the post-time favorite. All have the credentials. And don’t be shocked in a longshot like Filly Forty (Jamaica Patton), C Far (Gary Rath), Send For Me (Tim Curtin, San Antonio Rose (Pat Curtin), Hope Hotspur (Mike Oosting) and Dandy’s Dududidudu (Todd Warren) pull off an upset. It’s happen before and it’ll happen again. An interesting twist to the Violet showdown is that Incredible Tillie champion Princess Sage and Du Quoin’s Director Award victor Dee Tumbleweed are not only both trained by Freddie Patton Jr. but there’s the family bragging rights on the line tonight. While Dee Tumbleweed is basically a stone-closer Princess Sage is versatile and comes into the Violet Pace showdown in peak form for Freddie who owns the filly in partnership with Kelli Jo Bell of Windsor, Illinois. The Sagebrush filly captured her elimination last week by more than four lengths in 1:55 flat and nine nights earlier took the Incredible Tillie Final in easy fashion, too, drawing away by almost two lengths in 1:55.3. 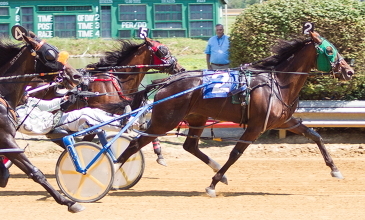 Violet Trot contender Dee Tumbleweed (Cornelus Cavett) proved best at Du Quoin in the Director Awards Final. (Four Footed photo). In her freshman season Princess Sage has notched 7 wins in 10 starts with a pair of runner-up placings. Her only finish worse than second came in the fourth leg of the Tillie when she made three moves before tiring in the lane and ended-up fifth. “She was a little off her game in that one,” said 52-year-old Mississippi native who has annexed numerous leading driver titles on the Illinois fair circuit. “She did some coughing a day or so before the race. She didn’t have a fever or anything like that but she wasn’t at 100 per cent going in that race. I probably should have scratched her. “Princess Sage is a filly who wanted to pace right from the beginning. Unlike my other young colts and fillies who wanted to run at times she started pacing from day one for me. Cardinal Favorites Prevail: The Tom Simmons Stable’s Fox Valley Herbie powered past to win last night’s $29,550 Cardinal Pace for 2-year-old ICF 2-year-olds while Louscipher (Pat Curtin) was an easy front-end victor in the $17,850 Cardinal Trot for the Roshun Trigg stable. Fox Valley Herbie ($4.20) was Mike Oosting’s fourth winner on the 10-race card and the fifth triumph for the Benita Simmons owned colt who motored home in a quick 26.3 last quarter at the end of his 1:54.1 mile. Fox Valley Nemitz (Pat Curtin) closed strong to be second, beaten by three-quarters of a length. Pat Curtin took the even-money favorite Louscipher ($4.00) to the front from the one-slot and the home-bred gelding, owned by his breeders the Flacco Family Farm of Alexis, Illinois made every pole a winning one, pulling away by four-plus lengths over the second place trotter Polar B in the 1:58.4 mile. The Illinois bred racing situation may be shell of what it once was but there are still some bargain buys at the yearling sales that come along yo become good money-makers for those willing to take, in most cases a small risk. The two-year-old Fox Valley Herbie, one of the favorites in tonight’s $29,550 Cardinal Pace Championship has turned out to be one of those “steals” for veteran horse Tom Simmons. The Springfield based trainer spent only $2,800 at the 2014 Walker Sale for the Yankee Skyscraper colt who has banked $66,719 in his first season with a chance to pad that total in tonight’s Cardinal. 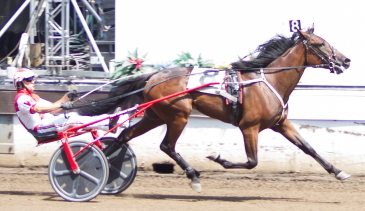 Fox Valley Herbie is the first foal of Hereshecomesagain (1:53.2), a daughter of The Big Dog. The now Fox Valley Standardbreds broodmare raced for the Joe Anderson Stable from 2004 through 2008. Simmons interest in “Herbie” came about because of urging from others. “A couple of the girls that work for Walker’s were begging me to come and look at the horse. I did and he’s a big good-looking colt. He is a good body horse so I thought I’d take a chance on him,” said Simmons who has over 3,300 wins as a driver and is closing in on 1,700 as a trainer. Fox Valley Herbie has had some big last quarters in him but in the Incredible Finale final he wasn’t taken back. Instead he was used early and raced on the front where he ended up a nose behind the winner Gabe Henry. Herbie didn’t have is usual big late quarter, coming home in 28.1 in the championship. Fox Valley Herbie went win-less in his first five starts and then got his maiden victory at Charleston in the Illinois Stallion Stake for 2-year-olds with Simmons at his lines. Two starts later he won at Hawthorne and has been one of the top ICF freshman colts since. “The horse had a bad start. I qualified him and he qualified well but that’s where I saw he wasn’t real good on the front. I started him at Hawthorne and he got a whip or something in his face and made a break. “I qualified him again the next day at Springfield and he came home in 26 and a piece. The following start (the first leg of the Incredible Finale Series) he bled, so it took him a little while to get put it together. Like I said I don’t think he’s a front-ender. He’s a horse that needs to come off the pace. In his Cardinal elimination less than two lengths separated the first four horses and tonight’s final figures to be another very close and exciting finish. Fox Valley Herbie (Mike Oosting) has the pole position. In posts two through ten are Uptown Sleaze (Ridge Warren), Fox Valley Jeter (Kyle Wilfong), Fox Valley Sparty (Kyle Husted), Fox Valley Reggie (Freddie Patton Jr.), Gabe Henry (Todd Warren), Fox Valley Nemitz (Pat Curtin), Fox Valley Hoss (Matt Krueger), Fox Valley Inferno (Casey Leonard) and Slzburgerslzburger (Bobby Smolin). Hawthorne track record holder Anna’s Lucky Star will put her six race unbeaten streak on the line in Sunday’s $18,900 Violet Championship. The home-bred filly has almost $37,000 in her freshman season despite starting her career about a month after others in her division and missing the Incredible Tilly stake series. Trained by Nelson Willis for her Salem, Illinois owner and breeder Danny Graham, Ann’s Lucky star first start came in late July, about a month after the stake series got under way at Hawthorne. Anna’s Lucky Star first stakes race came in her State Fair elimination at Springfield, her third straight win. She followed with a career fastest 1:56.4 victory in the final and 10 days alter took the Shawnee at Du Quoin in 1:58.1, all with her regular driver Kyle Wilfong. Did Danny think she was his home-bred filly would be the very good ICF trotter right from the start. Anna’s Lucky Star is out of Graham’s very successful broodmare Queen Jamie. 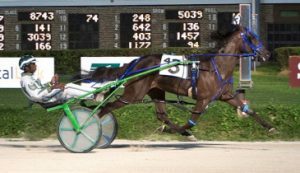 Her most notable offspring was Anthonyskywalker (1:54) who raced for trainer Homer Hochstetler from 2019 through 2013 and earned almost $200,000 in those years. “Queen Jamie’s first foal was Sonny Knew, named after my dad Sonny Graham and trotted in 1:56.2 at Springfield, a national season record that year for a 2-year-old trotter,” continued Danny. “She had Red Victor who raced for Roger Welch who then sold him. The filly had a 3-year-old record of 55 and a piece. A few years later she had Powerful Anthony and we ended up selling him to my brother Doug who raced him at the County Fairs and won something like $25,000 with him. Anna’s Lucky Star’s 1:58.2 mile last weekend was a new track record at Hawthorne for a 2-year-old trotting filly and expectations were high on the filly’s chances for Sunday. However Danny’s enthusiasm was dampen after a phone call Wednesday from his trainer. “I did get some bad news from Spider (Nelson Willis) who called and told me the horse was sick today (Wednesday). They’re treating her and right now it’s 50-50 if she’ll race Sunday. The two through 10 posts will be manned by Heartland Honey, Sis’s Ellie Mae, Fox Valley Elana, Lou’s Game N Match, Daisy Luke Duke, Fox Valley Ella, T E’;s My Way and Beatrice. We all know things don’t always go as planned and sometimes that can be a good thing. It turned out that way for one-time Chicago circuit driver Wayne Temple. The now 73-year-old Ohio native went to the Illini Classic Sale two years ago with “no intention of buying a horse,” Instead Temple is the happy owner of Polar B, one of the favorites for Saturday’s $17,850 Cardinal Trot Championship for ICF 3-year-old colts and geldings. “I went to the sale not looking to buy anything but when Polar B came into the ring he caught my eye,” said Wayne. “There wasn’t a lot of bidding on him and his price ended up only being $2,500. Polar B has earned over $44,352 in his freshman season with a good chance to add to that total Saturday evening. Polar B notched his first victory of the career about a month later and has been no worse than second since. “We had some problems with his shoes early on,” continued Temple. “Hopefully we’ve got that taken care of. He did look solid trotting the other night. We’ve had the horse going back and forth from the racetrack with Hosea to out here at my farm (Mokena, Illinois). Temple drove on the Chicago circuit in the early and middle 1970s competing against the likes of Walter Paisley, Daryl Busse, Stan Banks, Joe Mark Jr, Jim Dennis, Jim Curran and Jerry Graham. 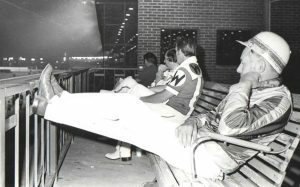 Wayne was a regular at Sportsman’s Park when the racetrack annually lured such Hall of Famers as Stanley Dancer, Joe O’Brien, Billy Haughton, just to mention a few, to compete with their star pacers and trotters in its nationally recognized American National’s. I posted a picture of the porch outside him old Sportsman’s Park driver’s room where horseman would go out and watch the action themselves on those summer nights. To the right of Stanley Dance is Wayne Tempe. He was always easy to spot with that big “W” on the upper arm of his white-black-red driver colors. Temple racked up 1.164 wins as a driver before going to work for the late Gas City boss Bill McEnery. Saturday Wayne will be back at Hawthorne to watch his Polar B (pp 6) takes on Louscipher (Pat Curtin), Matt Q (Casey Leonard), Picky Picky Valor (Brian Carpenter), Cassisandfifth (Mike Brink), Lougazi (Jamaica Patton), Dr. Spengler (Curt Grummel), Trixie’s Jethro (Jared Finn) and Flash Forward (Kyle Wilfong). A Booming Interruption: An unexpected almost hour long fireworks display delayed last night’s Sunday racing at Hawthorne but don’t blame the racetrack for the unwelcomed show. It was the Town of Cicero that put on the display “to celebrate Mexico Independence Day” according to a Cicero Town Hall representative. That might have made sense if Sunday wasn’t September 18. Mexico Independence Day is September 16. Last Wednesday’s column on the “Dubious Record” achieved by Hawthorne drew a quick and rather terse reply from the race track that it was inaccurate. I wrote that that the last race went off at 12:10 Sunday morning, later than any other Illinois Super Night type program in history, and that’s not disputed. My primary concern was that the USTA posted a 10:40 pm scheduled last race post time and that made for a 90 minutes later off time for the horses on Lasix in the 12th race. Also I pointed out that the off times on the Night of Champions varied from six minutes in between races to 45 in-between. That information came off USTA’s official charts, the same off-times posted on Hawthorne’s Web-site under “Results,” also courtesy of the USTA. You would think the governing body of harness racing in the United States is providing accurate data but obviously in some cases it isn’t. “It seems like the major points of your article are two things, first, the length of the card, and second, the amount of time/off time of the final race. “I have attached the actual post schedule that was distributed to ALL horsemen for Night of Champions. As you can see, the scheduled post for the last race was 11:35PM, not 10:40PM as you stated in your article. Therefore, no horses were ever racing 90 minutes past their scheduled post. “Additionally, I have spoken with the state vet numerous times on the subject of Lasix He has stated that as long as you remain within one hour of the time Lasix was administered, there is not a performance/lack of performance advantage or disadvantage. So the actual 35 minutes later that Race 12 went off than the race’s actual scheduled post was of no concern to any horseman or vet on Saturday night. As far as the other “inaccuracies” that Miller pointed out, “don’t shoot the messenger.” The stated facts in my story were provided by the USTA. It seems the USTA isn’t getting, or for that matter is even seeking from Hawthorne the correct scheduled off times for its results page on its web-site. What they dole out regarding scheduled post times is clearly incorrect information. I suggest that Hawthorne pressures the USTA to get its act together to get the right facts posted to the public. If that’s going to take too much time and money maybe Hawthorne can display the correct scheduled post times on its site or perhaps work something out with the IHHA to have it posted on theirs. The fact that Hawthorne switched its first post time on three different occasions in a five month meet did create unnecessary confusion for horsemen. With those post time flip-flops it made for time adjustments on the track’s ever-changing Lasix schedule. In my view the back and forth starting times shouldn’t have been necessary to put into place. Hawthorne will have seven long months to come up with a first race post for 2017. It should put on its big boy pants, make a decision, and this time stick with it. After the first race is concluded nightly the likely post times are meaningless. For Hawthorne, and many others it’s all about jockeying for post-time position with other race tracks. Do we go ahead of this track or wait to go behind them on a particular race? What is a concern to me is that, according to the Hawthorne e-mail, the USTA had “a couple of incorrect off times in its charts.” It makes you wonder what, if any, other erroneous data is bring gransmitted. If there are indeed “occasional incorrect readings coming from the Hawthorne Tote Board the track has more than ample time to get it fixed before next year’s harness meeting finally rolls around. As far as its dragged-out five-plus hours Night of Champions racing program is concerned, I’m still of the opinion that it’s too long. I have stated my view many times in the past on the lateness of Balmoral’s Super Nights. The vast majority of patrons don’t want to sit through a five hour program with often 25 minutes in between racing action. I realize the track feels it needs to generate every nickel and dime it can from the betting public but it does so with not much of a concern for the hardship it creates on the late race caretakers and trainers, especially those who have to van back to the Springfield area, or elsewhere in our state, and arrive home at 4 o’clock in the morning. The average time for a major league baseball game is 2 hours and 58 minutes. For an NFL game its 3 hours and 12 minutes. For Hawthorne’s Night of Champions program it was 5 hours and 12 minutes. Two hours longer than the length of a pro football game, really?